Tastes just like Apple Pie, without the refined sugar and junk! 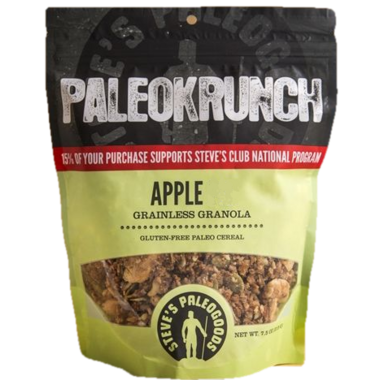 Apple PaleoKrunch adds dried apples and warm spices to our lightly sweet blend of almonds, seeds, coconut, and a touch of honey. It can be eaten as a cereal or as a snack straight from the bag. Gluten-free, grain-free and delicious, PaleoKrunch is handmade using high quality ingredients and free of GMO’s, refined sugars and junk. If you love apple pie, you’ve got to try Apple PaleoKrunch. The easily portable and conveniently resealable bag makes PaleoKrunch perfect for tossing in your lunch box, gym bag, or backpack. 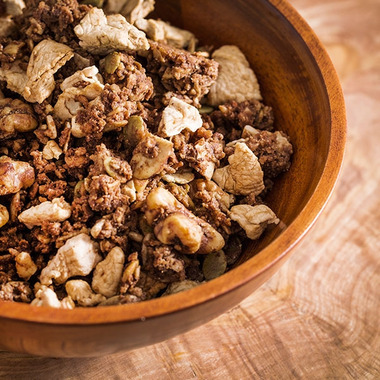 Whether you're in the great outdoors hitting the trail on your next camping trip or need a nutritious snack to get you through the day, this grainless granola will have you covered. Steve's is a small family owned and operated business since 2008. Their products are made by hand in small batches, using the best ingredients, as close to nature as possible. Handmade is the Paleo way! Ingredients: Almonds, Shredded Coconut, Walnuts, Dried Apples, Sunflower Seeds, Coconut Oil, Honey, Cinnamon, Ginger, Nutmeg, Cloves. PRODUCED IN A FACILITY THAT USES NUTS. LOVE this granola! Fantastic breakfast option for anyone following a strict GF diet and who wants to avoid oats. I warm it up with milk (regular or almond).